Note: if you don't see the three-plus buttons when hovering on the top cells (Backlog/Requested/In Progress/Done) , means you are running on version 5.17 that is maintenance mode only. To edit your board, please refer to the following article. Please, contact csm@kanbanzie.com for an upgrade to Kanbanize Version 6.0. 1. How to turn on the edit mode of your board? Editing your Board helps you to map your unique workflow and visualize your process. The system allows you to edit every Board in your account. The edit mode of the board allows Account Owners and Workspace Managers to customize both the INITIATIVES workflow and the CARDS workflow. Users with the relevant permissions can create new columns, sub-columns and swimlanes as well as multiple team workflows. With the Workflow Designer, users can fully customize their board workflow horizontally and vertically by merging columns and lanes to the specific needs of each team. To turn on the edit mode, select the “Edit Workflow” icon at the top of each board interface. (2) Change the card sizes for the board. Select any of the following options: T-shirt sizes; Fibonacci sequence; No pattern. (3) Control the "Work in Progress limit" system behavior for the board: allow or deny exceeding the limits. - Save each change you've made via the Save button. - Undo or Redo any of the latest changes you have performed using the respective dropdown lists. The keyboard shortcuts are: CTRL + Z (undo) and CTRL +Y (redo). - Discard changes via the respective buttons. If you discard the changes they will be lost permanently. You will not be able to apply them again using the "Redo" button. You can rename the labels of INITIATIVES WORKFLOW and CARDS WORKFLOW in accordance with the use-case scenario. Each flow has a separate Cycle time configuration panel to the right side. You can use the Delete and/or Disable/Enable buttons to perform the respective actions. Adding columns to the Initiatives workflow is only allowed in the Backlog area. Hovering on the Backlog cell, the three-plus buttons appear to the left, right and bottom of the box (img. 2). Click the plus sign to create extra columns and prioritize your product backlog items. You can name columns anything you like just click on the title and it instantly turns into an editable text box. Similarly, you can easily set up the limit and the number of cards per row. Important: Don't forget to save the changes you made -> click Save at the top right corner of the screen. The Portfolio lane is the default swimlane of the Initiatives Workflow. With the Workflow designer, you can create additional swimlanes after the default lane to classify Initiatives of different teams, projects, etc. Hoven on the Portfolio lane cell and click the plus sign to create a new swimlane (img.3). Note: use the pallet icon in the cell to color the new swimlane for better visualization. From the gear icon, you can set the lane limit. Hovering on the top cells (Backlog/Requested/In Progress/Done), the three-plus buttons appear to the left, right and bottom of the box (Img. 4). You can create multiple complex column structures within your lane that allow you to customize any board to any process. You can name columns anything you like just click on the title and it instantly turns into an editable text box. Similarly, you can easily set up the limit and the number of cards per row. Important: Don't forget to save the changes you made -> click the Save button located at the upper right corner of the screen. Note: You can divide cells into sub-column structures for even more refined visualization. The swimlanes in the Cards workflows separate different types of work activities and classes of service. You may have as many swimlanes as you want in order to organize your tasks. To create a new swimlane, hover on the New swimlane cell and click the plus icon. To create a multilayer board structure, click the "Create New Cards Workflow" button and set up the flow phases. 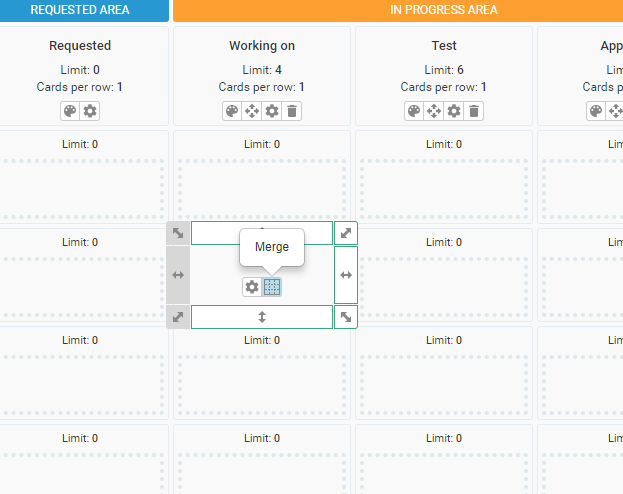 You can merge cells across lanes/columns to fuse work process stages and classes of work. Click the merge icon and use the rectangle tool to draw out the cells you want to merge/unmerge in the section. Use the corner cursor to drag diagonally across nearby columns and lanes. Use the side arrow in order to merge vertically aligned cells. Use the downward arrow to merge cells horizontally. Arrows highlighted in grey indicates that merging is blocked in the respective direction. You can only merge columns from the same section (Backlog section only, Requested section only; In Progress section only, Done section only;). You cannot merge columns across different sections. When you merge two adjacent columns, the system prompts you to select a primary column (1), which will reflect the state of the cards in the merged cells in terms of board positioning. Select the primary column from the dropdown list and take into consideration that the WIP limit that is set for the primary column will dominate. Each cell in the board has a cell limit (2) that is set up by the Account Owner/Workspace Manager. Cell limit is the total number of cards allowed in the cell. Whether the limit can be exceeded or not is controlled by the board setting "Allow exceeding the limits", which is available on the top side of the board layout. use the "Cell Properties" panel that automatically appears when merging cells and input the limit for the merged cells. click on the "limit" icon at the top of each cell to turns it into an editable text box and input the number. Note: The system provides the option to transfer a column to a different section using the drag & drop button. If there are cards in the column or lane that you want to delete, the system prompts you to choose where you want to move those cards to (img.5). 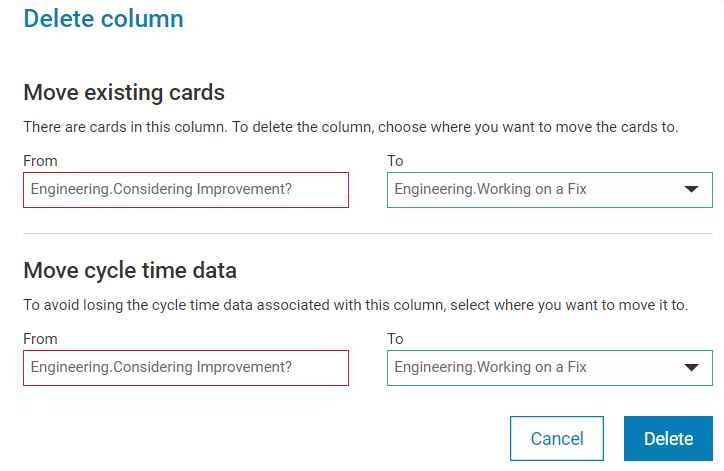 To avoid losing the cycle time data associated with the column or lane you want to delete, select where you want to move the data to and it will be reflected in the analytics accordingly. (3) Use the gear icon to edit column details - please, check the detailed description of the gear icon capabilities below*. - Column name - name the column as it will appear on the board. - Column Limit - set up the column limit to define the total number of cards allowed in the column. - Cards Per Row - define how many cards will be displayed horizontally in the column. The default number is 1. - Column description - type instructions for your team regarding the intended usage of this column. The description will be visible at the bottom of the column and when you hover the mouse over the column name. - Select the type of column: Active or Queue. This helps project managers to track the process efficiency. - Active column: All columns where cards are being worked on should be marked as ACTIVITY. E.g. "Development" is an activity column; "Verification" is an activity column. - Queue column: All columns where cards are waiting to be processed should be marked as QUEUE. E.g. "Ready for Verification" is a queue column; "To be Approved" is a queue column. All columns defined as "queue" are marked yellow at the upper right corner. Hovering over it produces a tooltip reminding the team members that cards should not stay too long in this column i.e. must be processed faster to the next stage in order to decrease the non-value adding the time of delivering an item.